Darry was a tireless worker and very committed to the education of all the public school children under his direction. Mr. Marshall carried out all of his duties as Principal and always was ready do anything that I asked of him. My relationship with Mr. Marshall was pleasant and rewarding. Read more testimonials here. I’ve known Darry for over ten years. He is extremely caring and giving. For example, I have watched him give money to students or buy them items that they needed. Darry is one of the kindest people I know. If Darry says that he will do something, he will make sure that is done to the best of his ability. Read more testimonials here. I’ve known Darry Marshall for fourteen years. Mr. Marshall always showed the utmost respect for the other teachers and administrators. Also, he demonstrated great leadership and integrity. He always sought to do what was fair in his administrative interactions and requirements. Read more testimonials here. Darry Marshall has always had a drive for excellence in meeting the goals for the students of South Tipton County both as an award winning coach on the field and as an administrator in the school. I am so pleased that he is willing to serve again in a leadership capacity and to continue to make a difference in the community! Read more testimonials here. I’ve known Darry Marshall for over ten years. He has a fighting spirit that always fights for the right things in life. He has shown in his decision making that he is a Godly man who prayerfully considers all the answers that need to be made in life and work. Read more testimonials here. Since 1994, I have watched Darry lead his family in church and in the community to be good citizens. Darry coached young men in football, instilling in them the importance of hard work. He not only prepared them for football he prepared them for life. Read more testimonials here. I have known Darry Marshall for thirty years and have found him to be a person of high integrity. I have enjoyed watching his career as teacher, counselor, coach, and administrator. During those years he received many accolades due to his love for students. He is a devout Christian who seeks guidance from above in all endeavors. He has served the city of Atoka on the Planning Commission where new subdivision guidelines were implemented to improve our growing city. 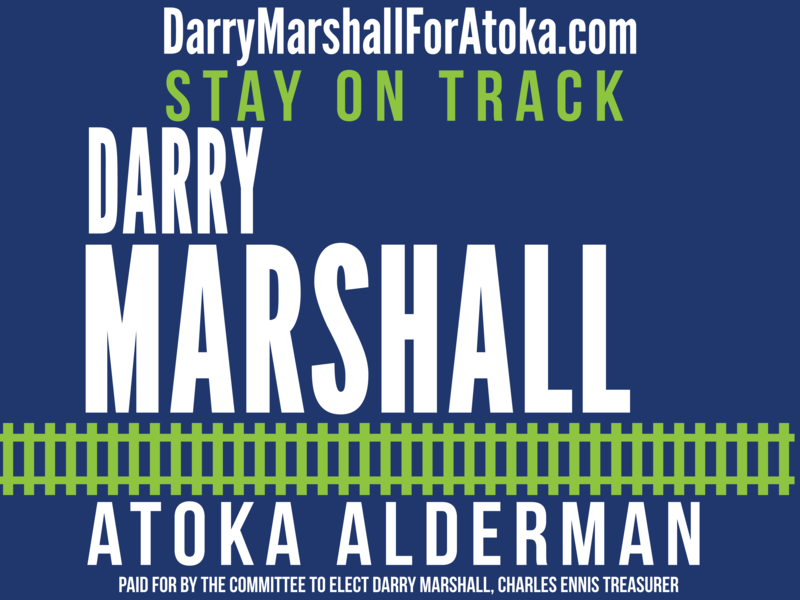 As alderman, he will continue to strive to make Atoka a better place to live and one that reflects pride for all citizens. He has a vision and is willing to listen to all who have concerns. He is a man who will do what he says and will be a great asset to our town. Read more testimonials here. I had the distinct pleasure of working alongside Darry Marshall when he was the Head Football Coach at Northside High School in Fort Smith Arkansas. Darry inherited a team when hired that had fallen on hard times having had several losing seasons and many of their best athletes and students were transferring to the newly built school across town. I watched Darry first hand reignite a schools spirit, inspire kids with no guidance at home to get out of the hallways and participate on the football team again. I watched Darry bring a school of mixed cultures from Vietnamese to African American to white into harmony working after a common goal of being a Champion. I watched Darry handle adversity, the press and many old time nay Sayers in the community and ignite a belief again that Victory was possible. Darry led an under talented multi cultured team at Northside to the 8A State Championship in less than one year of inheriting the job. This feat has never been repeated since he resigned as t Head Coach 12 years ago. The reason I followed Darry to Fort Smith from Covington TN is because I had witnessed from across town him doing the same thing with the Munford High School Football Program. Darry also led Briarcrest Christian School to a championship earlier in his career. While Head Coach at Briarcrest he hired and mentored Hugh Freeze the Head football coach at Ole Miss. Darry left his tenure as Head Football coach and became the Principal at Munford High school where he was responsible for High Academics, Great Athletics and a nationally known Band. Darry has shown a remarkable ability over his 30 plus year career to lead and motivate people from all diversities in our American Culture. There is no doubt he has the ability to lead the town of Atoka into a new era of prosperity and harmony. Darry has a 30 year track record of making every group he has lead a Champion again. Read more testimonials here. The one characteristic that sets Darry apart from other candidates is that he is a great listener. As a representative of the citizens, the alderman needs to understand their needs and concerns. He will take time to listen, then work with others to develop game plans for action. His experiences as football coach and principal will enable him to motivate others as well as work alongside others to ensure a prosperous future for the Town of Atoka. Read more testimonials here. In 1994-1995 Darry Marshall came to Munford High School and turned a desolate football program into something to be proud of. Since that time he has played a major role in the education of the youth in our community. His leadership ability is second to none. I have seen him portray his Christian values first hand and I have the utmost respect for him. He has my support to once again become an influential leader within our community. Read more testimonials here.